YCCS students proudly present the Highlights of Civic Engagement Initiatives they have been studying and exploring this current semester at the Next Generation Leaders Student Expo to be held at the Great Hall of the Congress Hotel on Thursday, June 1, from 10:00 am to 2:00 pm. The Expo will showcase and document their experiences through social media as reporters, journalists, bloggers, videographers and podcasters as well as featuring a musical appearance by KatieGotBandz, a well-known Chicago area rapper, and an alumna of Youth Connection Leadership Academy. 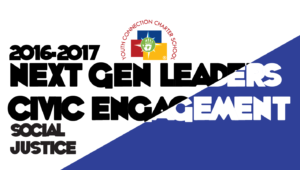 The event will be open to the greater YCCS community. 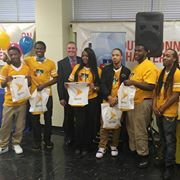 Thanks to the generosity of Sprint and its Sprint 1 Million Project, the students created their work using mobile devices with hotspot and wireless connectivity that enabled them to collect hours of digital interviews and video footage that will be shared during the Expo. Motivated by the impact and repercussions of the 2016 Presidential Election, twenty Next Generation Leaders took to the road and traveled to Washington D.C. to attend the inauguration of President Trump and witness the counter activities occurring during and after the event, as well as the Women’s March the next day, interviewing dozens of participants involved in both these historic occurrences. Back home in Chicago, students continued their journalistic experience throughout the semester by chronicling their experiences as attendees of the musical Hamilton and the movie Hidden Figures. They also participated in and reported on four marches: the March for Science, the March for the Planet, the March for Immigration Rights and the March for Wage Equality that were held in Chicago. This sounds like a project I would have loved when I was young – would still enjoy now – and would be a highlight of my education. There is no substitute for hands-on learning in the community, with the community, and realizing that YOU are the person in control of your destiny, and sometimes, ours too. Many, many thanks to the teachers, staff and administrators who put this real-life, critical-thinking engagement together. Many, many thanks to the young people who participated. Your thoughts and visions are truly important.